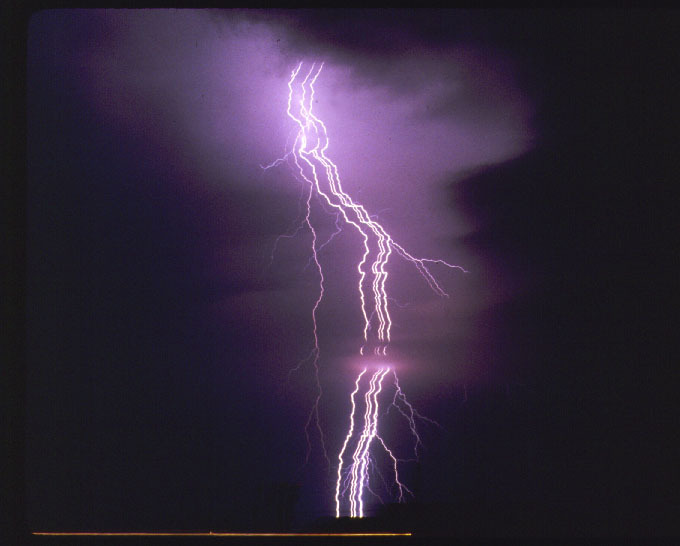 Here are some of my favorite photos of lightning. I took these pictures in 1980 and 1981 in the great plains area of the USA. If you would like to contribute an original photo, please send it to me via E-mail as a GIF or JPEG attachment. Make sure to include your name, the date taken, and the general location so that I can properly give you the credit. NEW! Create your own Calendar with these photos! 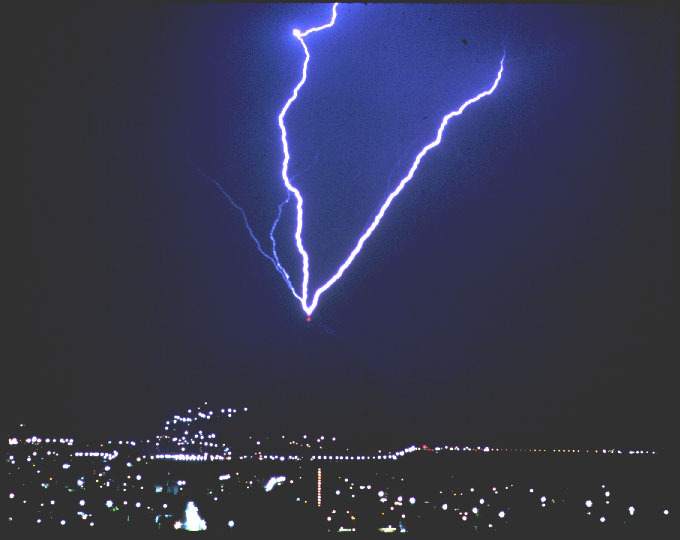 Photo of single cloud-to-ground (CG) lightning strike. This is a classic lightning strike. 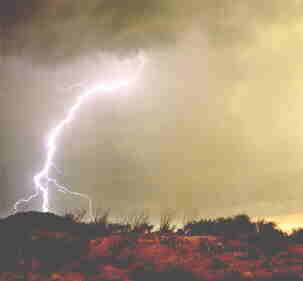 Photo of a dual channel cloud-to-ground lightning strike. Both channels originated from a single charge source high in the cloud. 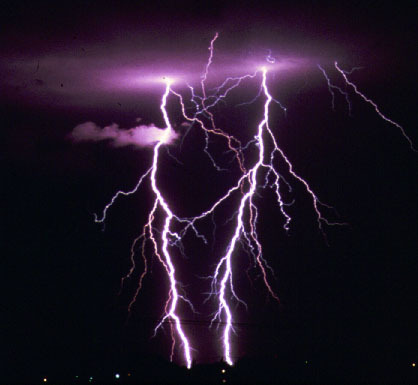 Photo of a rare triple channel cloud-to-ground lightning strike. This is not a multiple exposure. The next photo shows an example of a multiple exposure shot. A multiple exposure photograph. 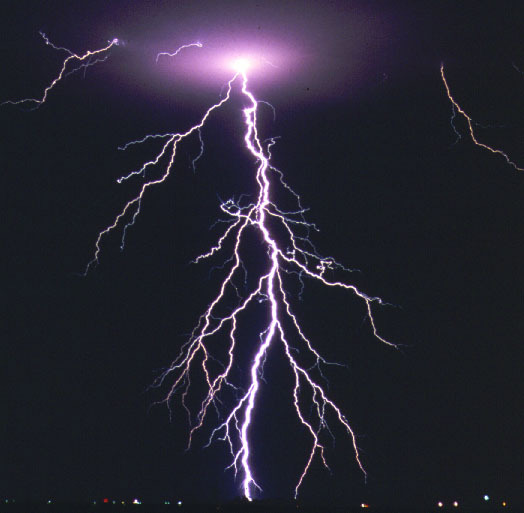 There are actually three distinct lightning strikes. Note that two of the strikes have multiple channels. A single "return-stroke" photograph. Notice the absence of branches. 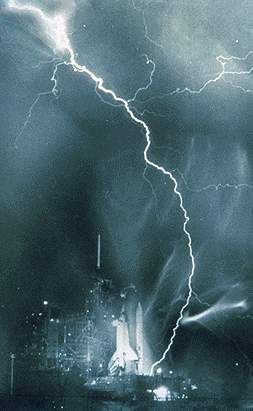 Here a lightning bolt hits a radio tower on top of a mountain. Notice that two separate channels were "attracted" by the tower. This is a good example of why you should stay away from tall metal objects in a lightning storm! This photograph was taken from inside a moving Chevy van. 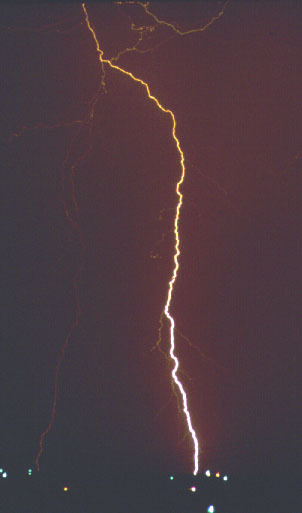 The "streak" nature of the photograph illustrates that lightning actually contains many "return strokes" in which the lightning hits the ground multiple times. Photo by Sam Walton for UPI. An interesting lightning strike near the space shuttle. "I took it in the Santa Rita mountains south of Tucson. I used a Rolleicord w/ 100 speed Fuji transparency film." 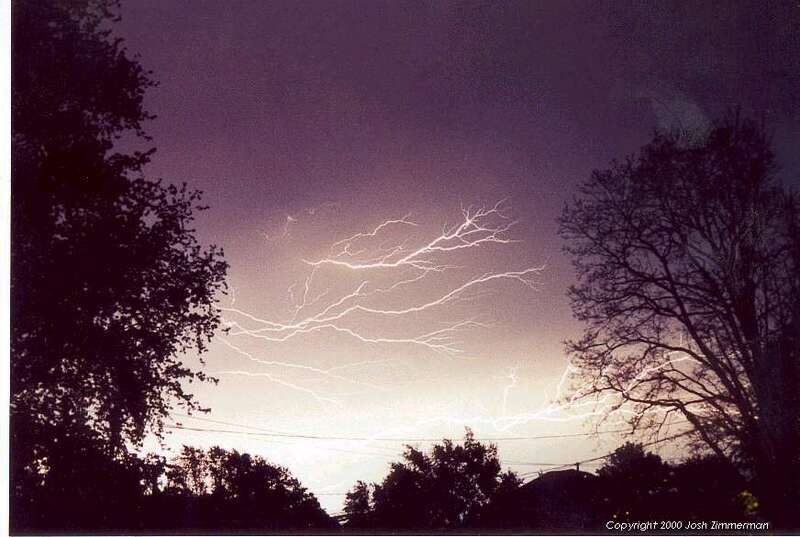 "This was taken in early June 2000 in Illinois." 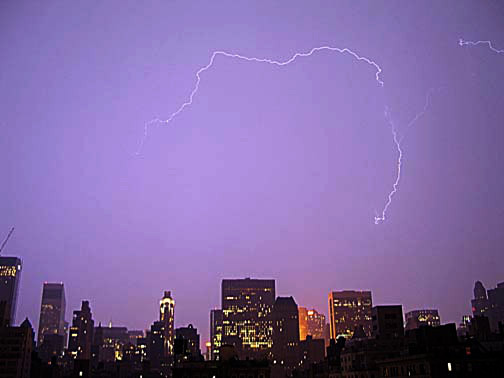 "I took this picture in New York City at 1:30 am May 11 2004. It's a shot facing downtown." We have been voted as Starting Point Hot Site! We have been awarded the CyberTeddy's Top 500 WebSite award. All photos are copyrighted by Dr. Steven D. Horsburgh unless specifically credited to another entity. All rights reserved.